The amount of school/art work that comes home each week is overwhelming; particularly when the kids are at kinder and the lower year levels. Try some of these tips to make managing the influx easier. Get the kids to empty school bags each afternoon; putting lunch box on the sink, school work in a designated spot or on a pinbord that is rotated often. The pic on right is my kids’ unpacking area. My pile on the left, Robbie in the middle and Charlie on the right. Homework book and school diary is stored here every night too. We also have an iPad charger for Charlie in this area. Get the kids to flag notices with Mum or Dad. Make time to fill out school forms straight away (when the kids get to the higher grades, get them to fill out the form in their best writing to save time), then sign and put the form back in the school bag. Remind the child the notice is there and that it needs to be returned to school. Make time at the end of each month for the kids to do a rough cull of their work. Decide what to keep and what to let go (this is a great way for them to learn the skill of letting things go). Take a photo of the work/art work you do not want to keep. Make a video of the child with the artwork and ask them to tell the story of how they created it. Write the child’s name, age and year level on the back of the artwork that you are keeping. Store what you have decided to keep in an in-tray (you may also need to designate another space for artwork larger than A4). 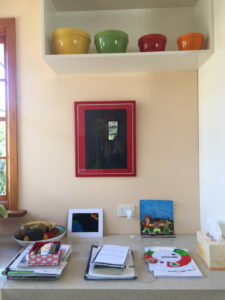 Make the in-tray accessible – the top of the wardrobe may sound like a good place, but chances are that the school/art work will end up in piles all around the house instead of being archived correctly. Make time to sort the pile one more time on the afternoon that the school year finishes . Keep only what will fit in a small folder (see pic on right), or use a larger tub and divide each year with a piece of coloured paper. Keep the following items in archive box each year: Portfolio of work, school photos and school report. Choose 1 or 2 pieces to frame and rotate each term/year. 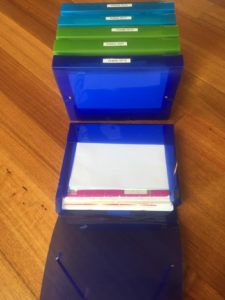 Creating an easy sorting, displaying and archiving system for the kids school/art work is much easier than trying to deal with a huge pile of work at the end of the year. Do you have a system you use at home that you would like to share with us? If you need a hand setting up a system for your kids’ school/artwork contact me here or you can book me here. Last time I shared this article, I was talking about our attachment to stuff due to the endowment factor. The fact that we value something more if we’ve owned it. This time I wanted to highlight the "sense of self". The article says "Often times, we include our things as part of our identity and sense of self. You probably have a favourite shirt or mug, and you favour it over similar items because you subconsciously view it as part of who you are". If you’ve ever tried to clean out your closet or garage, you know getting rid of stuff isn’t easy, even if you never use it. Here’s what leads us to get so attached to stuff, and how that makes it hard to let go….